It is said that, “When the student is ready, the teacher will come.” Though there have been many helpers along the way, the teacher who showed up for me was Swami Rama. Swami Rama dropped the body on the evening of November 13, 1996. Although naming no individual person as successor of the lineage, he is succeeded by many people who each serve others in his or her own way. Unfortunately, it is sad to say that there has been significant politics in the years since Swami Rama left the body, and at least two people falsely claim to be the SOLE successor of Swami Rama. Please also see the separate article relating to Swami Rama as holding the post of Shankaracharya of Karvirpitham in South India. 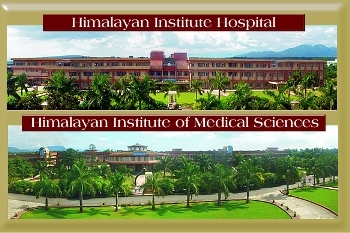 ORGANIZATIONS: Over many years a pattern emerged with the various organizations and teaching institutions Swami Rama founded around the world. He would start an organization to disseminate the teachings of the Himalayan masters, the people of the organization would either change or abandon the teachings, and Swami Rama would then renounce that organization. This has happened in Asia, Europe, and North America, and possibly other places. I personally know of at least seven such instances. 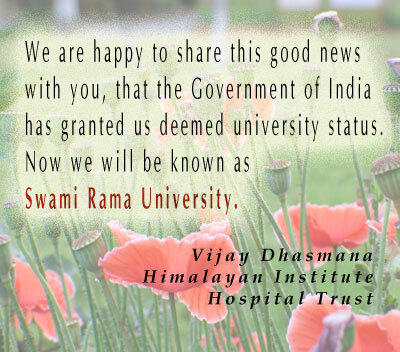 By the time Swami Rama left the body in 1996, the only remaining organizations with which Swami Rama was affiliated were the Himalayan Institute Hospital Trust and Sadhana Mandir Ashram, both of which are in India. I do not mention the names of the organizations that Swami Rama dropped, because that would sound too negative towards them, and most still claim affiliation with Swami Rama. New people have come to these organizations, and most of their students are probably not aware of this history. It is not my place to reveal those organization names here. RITUALS: Swami Rama often taught us through his books, lectures, and personal guidance that our tradition is a purely meditative tradition of the Himalayas, and that we perform no external rituals; our practices are purely internal. However, during the years since Swami Rama left the body institutions or groups founded by or related to Swami Rama have increasingly started performing external rituals under the guidance of Hindu pandits, priests. DEITIES: In our tradition deities are seen as symbols, not as real beings to be worshipped. UNIVERSAL REALIZATION: Swami Rama believed in, and taught the universality of the realization of spiritual truths, in the inner chamber of one's own being. He never asked to be followed or worshipped, or for any change in culture, or for or any conversion of religion. Rather, he encouraged self-awareness through practices of yoga meditation and contemplation, with an attitude of self-reliance. The job of the external teacher, he taught me, is to find the teacher within. wise and selflessly giving enigma. FEARS AND THE ABSOLUTE REALITY: Swami Rama continued to spread the teachings his own teacher had given him, that the first goal is to seek freedom from fears, and second, to seek the direct experience of the absolute reality at the core of your being, the center of consciousness that goes by many names. KNOWING YOURSELF: Swamiji taught that one should "know yourself at all levels," explaining that "After visiting hundreds of countries I have discovered that all over the world there is one great problem, and that problem is that the human being has not yet understood himself or herself, and tries, instead, to understand God and others." SIMPLICITY: While teaching the profound depths of the Himalayan masters, Swami Rama was also committed to simplicity. He writes, "You really do not need to know many things, but you definitely need to practice what you know. It is a sad thing to tell you, but I have not really learned anything new since I grew up. That which I learned in my childhood is what I have been practicing." That balance of depth and simplicity is one of the most beneficial and loving gifts of Swami Rama to humanity, his many students, and to me personally. This balance has been a major source of inspiration since Swami Rama instructed me to pass on the teachings to others as a representative of the Himalayan tradition. BOOKS: People ask me from time to time about the best books of Swami Rama to read. In the links below (in the box) there is an index of most of his books, and also a list of some specific recommendations. SWAMI RAMA VIDEOS ONLINE: Four lectures (41 videos) are online by Swami Rama on Saundaryalahari, the Wave of Beauty, which is a prominent text of Sri Vidya Tantra. The wave of creativity, love and bliss of Shakti is one and the same with Shiva. The lectures contain practical advice on advanced meditation practices of Yoga, Vedanta, and Tantra. These are from an independent site on YouTube. There are also now 85 videos of lectures by Swami Rama on the Yoga Sutras. In addition, there are videos on Mandukya Upanishad and Mundaka Upanishad. All of the videos are practical and useful regardless of whether or not you are familiar with the titles. 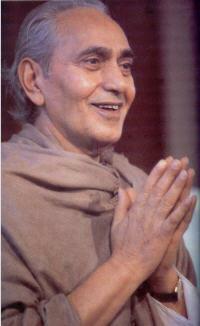 One of my fondest memories is of the day Swami Rama said to me simply, "You are on the path. I will lead you." He has done what he said he would do, for which I am truly grateful.